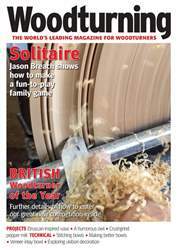 In issue 324 of Woodturning magazine we have lots for you to enjoy. In Projects Neil Turner turns and carves a decorative effect on a sphere; Walter Hall makes a shaving set; Mark Sanger creates a sculptural vessel with a carved and scorched finish; Colwin Way looks at traditional German candle holders; while Chris West provides plans for a trio of candlesticks. 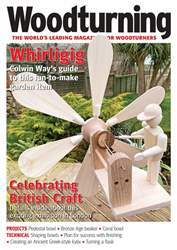 Plus Janice Levi turns a hinged bracelet and, in an extract from 30-Minute Woodturning, Mark Baker shows you how to make a bird box ornament. 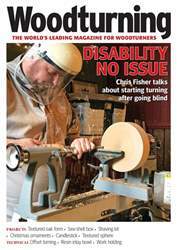 In the Techniques section, Richard Findley tackles resin inlays; Andy Coates explores propeller-style turning; Chris Grace discusses work holding; Emiliano Achaval and John Mydock collaborate to create a conch shell-inspired box; and Geoffrey Laycock looks at portable appliance safety. 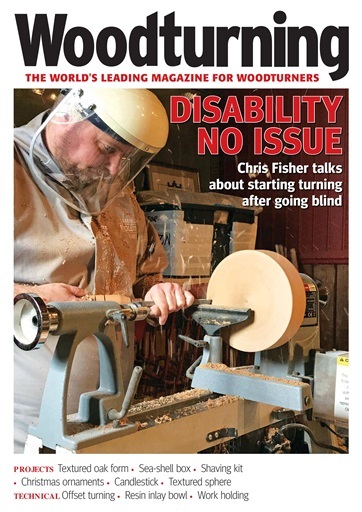 In Features, we meet blind woodturner Chris Fisher; Janice Elizabeth Berte talks to Louis Norborini about his love of turning; John Plater shares his advice for photographing wood turnings; and in Featured Artist, Margaret Garrard shares with us how her stunning piece, Lasting Love, came to fruition. As well as all this, we also have our usual 'Kit & Tools' pages, 'Leader' from the Editor, 'Community news' as well as a sneak peek of our next issue. 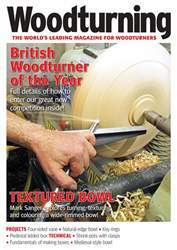 All this and more in Woodturning 324!